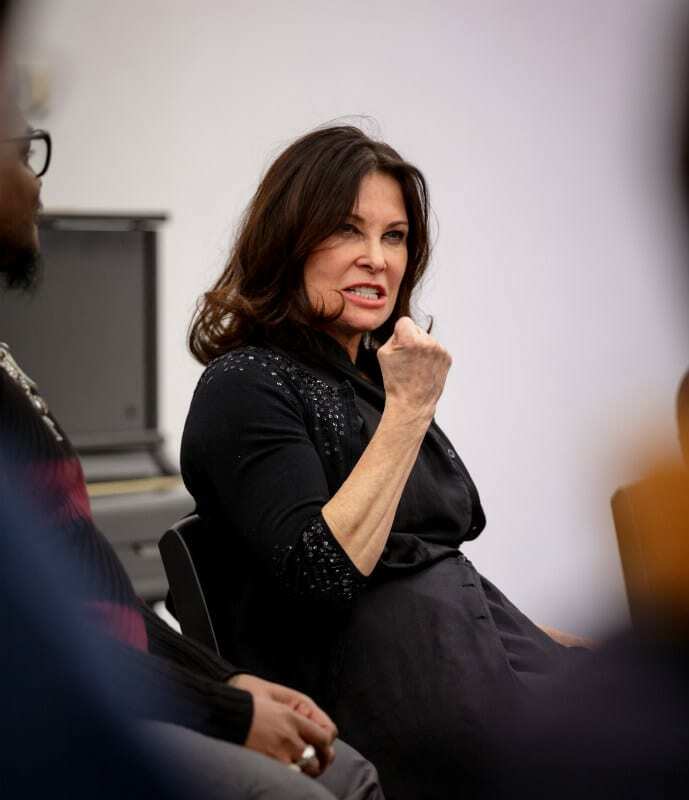 Earlier this week, actor, singer, producer, and philanthropist Jane BadlerHains visited the Victorian College of the Arts to share the story of her decades-long performing career with our Acting students – and to announce a new relationship with the Faculty. I was born in Brooklyn, New York, and had a fairly dysfunctional upbringing. Performing was a way of escaping into my own fantasy world. I would sing, play instruments, and act. When I was 18, I entered beauty pageants, and was in the Miss America Pageant, which taught me a lot about competition and poise. After studying theatre at Northwestern University I decided to go to New York to be an actor. My mother was so frightened for me because I didn’t know anyone and didn’t have any money, but I was very determined. Talent is important, but there are a whole lot of other qualities that are right up there – and determination is one of them. I would get up every morning and knock on doors to get an agent. I had a couple of weeks of rejections and then, one day, this woman responded to me. Her name was Eileen Fields and I’ll never forget her as long as live. She started sending me out on commercials and within a month I was doing national ads for American Airlines and Hertz Rent-a-Car. I did bank commercials, perfume ads, Playtex bra … I was like the “it” girl for commercials. Maybe it was just the look I had, or maybe it was luck. 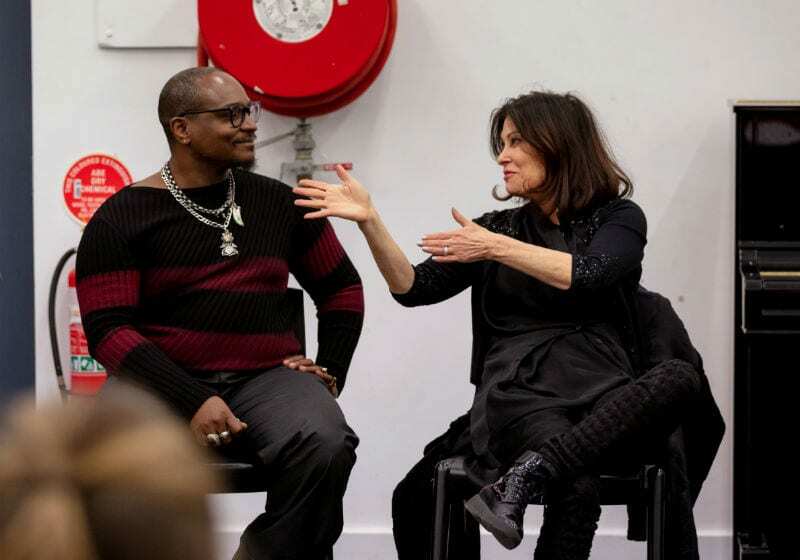 VCA Head of Acting Budi Miller and Jane BadlerHains. I was flown out to LA to test for [80s cult miniseries] V, after which I got a call – “Don’t leave town” – which is the greatest thing you’ll ever hear as an actor. I remember thinking V wasn’t going to be anything special, but it just blew up internationally. I played this fantastic character, Diana, an evil alien from outer-space who got all the best lines. 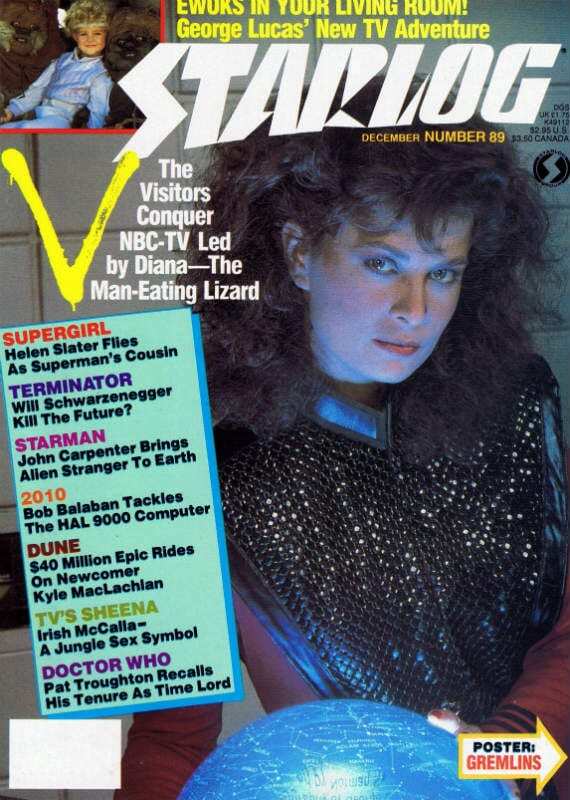 Jane Badler as Diana from V, on the front cover of Starlog magazine in 1984. Image by Tom Simpson, Flickr CC. I love playing powerful characters, like the head of the government or the head surgeon. I’m not really good at being victim – I know where my strengths are. If you look at all the old movie idols, like Rock Hudson and Katherine Hepburn, they all had their strengths. “I love playing powerful characters”, says BadlerHains. Photo by Sav Schulman. V led to so many opportunities, and it was a pretty exciting time for me, but I was struggling mentally. I had some great tragedy in my life as a younger person and I hadn’t dealt with it, so I had a lot of anxiety and instead of grabbing that one moment in time, I kind of let it dissipate. I played a couple of roles that were exactly the same, and then all of the interest started to die. I didn’t work for a little while, and I was running out of money. A couple of years later I was lucky enough to get cast in Falcon Crest, and then that led me doing the reboot of Mission: Impossible. I came to Australia for six months to shoot, where I met a man – my now husband, Stephen Hains. When I left LA to live in Australia my agent was very angry and cut ties with me. I started doing a lot of small, fringe, cooperative theatre. There were times when there were only eight people in the audience – but the rule was, if there were more people in the audience than in the cast then we had to do it. I really paid my dues – kind of backwards. In my forties, after seeing Kate Ceberano perform one night, I decided I wanted to sing and got a little gig at the RSL club in St Kilda – schlepping the speakers every week, and singing with a pianist for two hours. Eventually I was approached to do an album – which then became three albums. That saved me. If you’re a creative person, you just feel like you’re going to die if you don’t have ways to express yourself. When I found out they were going to reimagine V into a new series a few years go, I could feel my heart beating with how much I wanted to be in it. I flew to LA to meet with the producers, and even pretended I was living there. They said, “We like you, you’ve got a great energy”, and said they might write me a role. I had to go to Vancouver for five months to film and leave my family behind, which was a hard decision to make because my son was in Grade 12. In 2013, I met this extraordinary woman in LA, Beth LaMure, who had a script for a film called Daisy Winters. When I read it, I thought it was amazing. And I’d always wanted to produce films. A few months after filming was finished, Beth sadly took her own life, and all of a sudden it was my film. I was thrust into the world of contracts and distributors and sales people. The learning curve was really steep, but it’s been really empowering. I’m going through a kind of renaissance. After my incredible, crazy journey – first as an actor, then musician, and producer – I suddenly have the passion to act again. It’s amazing, because I didn’t for years. I’ve started taking acting classes again – I’m the oldest person there and have to keep my ego in check. But I’m looking forward to the next chapter of my life.